Announcing the winners of the 26th ever Right Place Photo Caption Contest! In honor of Friday the 13th... Presenting the top thirteen captions for this picture from AFP/Getty Images/Chip Somodevilla via "Yahoo!" #13: DRUDGE BREAKING: In a rare admission of fault today, President Bush declared that when he stated, "Harry Reid should be cannonized," he'd thought it had something to do with the business end of a Howitzer. #12: "Wherever there is injustice, you will find us. Wherever there is suffering, we'll be there. Wherever liberty is threatened, you will find... The Three Amigos!" #11: At the news conference, Harry Reid worked himself into such a hot rage that his head sprouted leaves in the dead of winter. 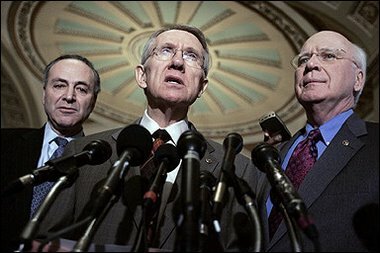 #10: Schumer and Leahy watch helplessly as Harry Reid's brain is sucked out. #9: Democratic Senators Reid, Leahy and Schumer deny that they took any illicit funds in the latest lobbying scandal as they hold a press conference in the J.A. Abramoff Room of DNC headquarters. #8: Reid's bore-waves only turn the living into cowardly zombies if they touch you. Luckily, they only extend a few feet. #7: "The MSM tell me that from that camera angle, it doesn't look like a tin foil hat at all!" #6: "...Therefore, in order to portray the proper image of Democrats, we've ordered a large number of these caps..."
#5: During a pre-news conference game of charades, reporters quickly guessed that the three politicians were doing, from left to right, Dracula, a palm tree and a sparrow mesmerized by a cobra. #4: Senators Reid, Schumer and Leahy finally admit to what most have suspected: Home for them is their flying saucer, parked in an Area 51 hangar. #3: "Beam me up, Howard!" #2: Is the main energy weapon about to fire? Oh, man, I am going to love the sequel to Independence Day! #1: "And if our demands are not met immediately, I will unleash the awesome powers of my Oversized Wheel Helmet of Doom!"